The Ramones', "Got a Lot to Say"
The Ramones', "I Don't Wanna Go Down To The Basement"
Hey Daddio, I don't wanna go down to the basement. There's something down there. I don't wanna go... Hey, Romeo, there's somthing down there. I don't wanna go down to the basement. 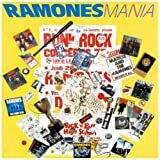 Is there any Ramones song that isn't repetetive anyway? The Ramones', "Life's a Gas"
The Ramones', "Now I Wanna Sniff Some Glue"
Now I wanna sniff some glue. Now I wanna have something to do. All the kids wanna sniff some glue. All the kids want something to do. Those are the only words in the song.